Your neighbor got eaten by his own Genetically Modified carrots! Defend your little organic farm with your brave rabbits! 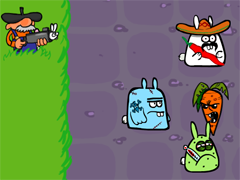 Mutant Carrots Attack mix shoot'em up and unit-placement, in order to modify your shots (ie:shotting a male rabbit on a female will net you 3 baby rabbits). 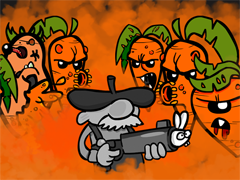 It's a scoring game where you face ever-growing waves of bloodthirsty carrots!! The game was made by a 3 person team (a programmer, a Sound Designer and myself) in 15 days during our spare-time for the Toulouse Game Show competition. The game had to be in the spirit with the show and so we decided to make an arcade game, allowing short sessions and competition via the score, all in an crazy spirit! The game ended up as a finalist of the competition!